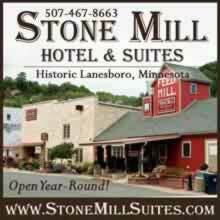 Affordable CD guided tour of Amish Country that can start in either Lanesboro or Harmony. Year-round - 2 1/2 hour tour of the Amish lifestyle with various Amish stops. Experience an exciting tour of Amish Country with one of our knowledgeable guides- offering van tours, car tours or group rates. Seasonal - Educational, respectful and fully narrated 3-hour Old Order Amish tours visiting fams and shops. Take a Buffalo Gal Ranch tours to see what it is like to be surrounded by these magnificent animals, shop in the gift shop for unique buffalo items, and see what the Native Americans have known for hundreds of years... buffalo meat tastes great! 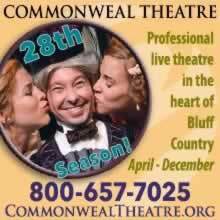 Award-winning, professional live theatre in our 30th season! With an enticing mix of musicals, comedies, dramas, and more, there's something for everyone at the Commonweal. Non operating 1917 filling station.Step back in time when gas was cheap and service was of the utmost importance. Annaul Festival of Owls takes place the first weekend in March and features city-wide owl-related events and programs. View our Karst display and displays from Harmony’s history. Self-guided historic tour of Harmony starts at the Visitor Center. 15 2nd Street NW. Maps for the Harmony Area Historical Society's historic signage walking tour of downtown Harmony may be picked up at the Harmony Visitor Center. The Houston Arts Resource Council (HARC) hosts the Houston Arts Festival the Saturday after Thanksgiving. You'll find local artwork including photography, stained glass, stoneware pottery, and much more! Houston Hoedown, celebrated annually the last full weekend of July, attracts thousands of visitors. The three-day celebration is jam-packed with fun and games for the whole family. A "Dashing Through the Snow" early morning race kicks off a day filled with Christmas-themed events. The evening concludes with a Lighted Parade, fireworks, and an "After Glow" celebration at the local Community Center. The International Owl Center is the only all-owl education center in the United States. It is open Thursday-Monday and features daily live owls programs and owl related events and programing. It also hosts an annual Internation Festival of Owls the first weekend in March. Multi-disciplinary arts organization offering year-round programming including place based artist residencies, "Surprise Sculpture" arts education, and the annual "Art in the Park" fine arts festival. LCT presents a winter play, a summer musical and silent movies in the park in the fall. Seasonal - Providing full hitch stage coach riding adventures in the Root River Valley or at your choice of location (within three hours of Spring Grove). 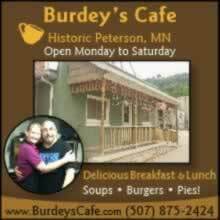 Experience the culture and values of Lanesboro's people. Three floors of history with new World War I and photography displays and an interactive phone booth! The museum is part of Lanesboro's voice to the world. The Minnesota State Veterans Cemetery - Preston is the second State Veterans Cemetery, after Little Falls, and had it's official dedication ceremony the Sunday before Memorial Day, 2016. Every October, the Monster Bash Haunted House serves up scary good fun- hours vary, check website before travelling. 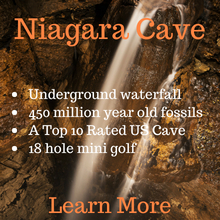 Just south of Harmony, Niagara Cave is one of the most fascinating and distinctive geological attractions in the US. Produces Lake Trout and Splake Trout for MN's Cold Water Trout Program. Seasonal self-guided tours and guided tours with reservations. Nearly 100 years after Peterson Station opened to serve SE MN Railroad customers, it welcomed the public again in 1974--this time as a museum, geneology center, and visitors center. Root River Yoga is a traveling yoga studio that serves SE MN and the Driftless Area. Root River Yoga serves the rural people throughout the communities of SE MN and beyond. Many students take multiple classes a week in the various locations. Classes are offered in sessions throughout the year. Drop-ins and new students are always welcome. 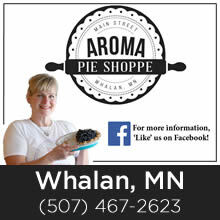 Please contact us with any questions or requests. THANK YOU! Displays of memorable artifacts and surrounded by landmark buildings, visit the Depot Museum to explore the past and learn how our community got its start. Year-round - One of five MInnesota DNR cold-water trout hatcheries. Gates open Monday-Friday, 7am-3:30pm.